When it gets cold, your barn chores can completely change. Filling up a water trough in some parts of the country may change to breaking ice, and hosing off your horse may mean drying them off with a towel and blanketing them instead! When the weather turns you have two choices – you can clip your horse or you can let their winter coat grow. If you don’t clip your horse during the winter months you need to be sure you groom regularly. Their coat will fluff up in the winter to retain heat so make sure you’re removing mud and dirt from the coat. If you plan to exercise your horse a lot during the winter months, clipping can make grooming easier and decrease the cool-out time. Even though it’s cold outside your horse will still sweat meaning their coat will be wet are you ride. If you leave items outside wet they can easily get chilled and may get sick. A clipped horse will dry much faster. There are different types of clips including a full body clip, a hunter clip and a trace clip. Talk to your veterinarian about the best hair cut for your horse or pony and make sure your clippers are working well! If you do clip your horse you need to blanket him or her. You wouldn’t want to go outside without a jacket and a horse without their thick winter coat wouldn’t want to either! Remember, a horse should be clean and dry before you put on a blanket. There are many different styles of blankets available – and you want to make sure the blanket you choose fits your horse properly. To fit, you should be able to run your hand along the blanket’s entire neck opening. You don’t want the blanket to be too tight and cause rub marks or sore spots. It should cover the tail and it shouldn’t shift much when your horse moves. If your horse lives further North where it warms up during the day, consider only blanketing at night. You don’t want Blaze to be sweaty underneath his blanket! 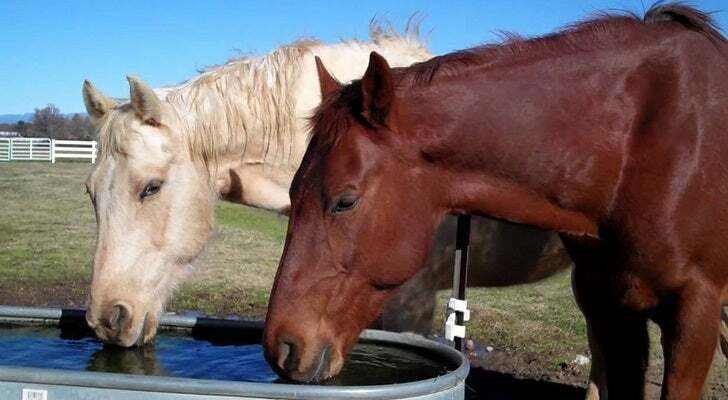 Even though the temperature drops in the winter your horse still needs plenty of water. To stay hydrated horses need anywhere from 15 to 75 litres of water a day! However, water troughs may freeze in Southern areas, especially overnight, so it is important to check your horse’s water supply several times a day - your horse can’t break the ice himself and they’ll be much healthier drinking water than licking dirty snow! Another way to help your horse stay warm is to make sure they get lots of fibre. Hay is higher in fibre than grain so feed your horse more hay during the winter months. When your horse’s large intestine digets the hay, their body creates energy warming them from the inside out – now that’s pretty handy! As always, talk to your veterinarian before making any drastic changes in your horse’s diet. All diet changes should be done gradually so you don’t upset your horse’s delicate digestive system. No one wants a bout of colic come winter. If your horse lives in a stall, make sure it’s comfortable in their winter home. Check that the stall has cosy flooring and bedding. Rubber mats drain well and are durable. There are countless options for stall bedding including shavings, wood pellets and various types of straw. Regardless of what bedding you use, make sure you use enough to keep your horse warm when they lie down. Also, make sure your horse’s stall has plenty of ventilation – it is better to have some air flowing through and be a little cooler than to have no air circulation at all! The sometimes harsh winter elements can irritate your horse’s skin. While grooming and blanketing can help eliminate some of the risk of these skin conditions, they may occur anyway – so best be prepared. Rain rot can happen when your horse is exposed to rain or snow and their coat remains wet for an extended period of time. Scabs form on their neck, shoulders, back and rump. The scabs can make a horse very uncomfortable and they can even keep them from being ridden. The best way to treat rain rot is to keep your horse as dry and clean as possible. Rain rot is contagious so make sure to use different grooming tools on a horse with the condition and bathe with medicated shampoo. Let them dry completely before putting on a blanket or turning them out. Mud fever is essentially rain rot on the horse’s legs. The best way to prevent mud fever is to keep your horse’s legs as clean and dry as possible. If your horse has feathers like a Clydesdale, you’ll want to be even more diligent about cleaning and drying the hair around the legs. So with winter just around the corner keep these tips in mind. Although horses have survived in the wild for thousands of years by themselves, in many harsh environment, we can still do our part to make these cold months a little bit nicer for dear ol’ Blaze or Star!